North AiR : Expanding Entanglements is a residency and research cooperation spanning six residency/ arts organisations in Scotland and Finland. Each partner fosters long term enquiries into its role and response-ability within the ecological crisis and together we look towards a post-fossil culture with a trans disciplinary approach. As a key part of this research cooperation we pool our resources and networks to think beyond dominant artist exchange models and look to question the role of artists’ residency in a time of climate breakdown. In an effort to address the demands of instantaneous global mobility and to promote a more ecologically aware network, we will be supporting the project’s mobility through land and sea travel only. North AiR : Expanding Entanglements seeks to explore the multiple knotted knowledges and practices situated between ecology, location, community and history in order to share and learn from these relationships. These residencies do not seek final outcomes but look for applied and expansive research into the above ideas and questions. The localised nature, ecology, and society, as well as the scientific environment and infrastructure of the programme is intended to act as a catalyst for AiR North: Expanding Entanglements. In Finland: Mustarinda, surrounded by the ecologically diverse old-growth forest extending from the borders of the Paljakka Strict Nature Reserve; Ars Bioarctica, organised by the Bioart Society together with the Kilpisjärvi Biological Station of the University of Helsinki in subarctic Lapland, near the borders of Sweden and Norway; and KulttuuriKauppila Art Centre located at the confluence of the River Ii and the Gulf of Bothnia. In Scotland: the Scottish Sculpture Workshop (SSW), a making facility within the foothills of the Grampian Mountains and close to the Cairngorms National Park, at Timespan in Helmsdale, a coastal village in East Sutherland at the mouth of River Helmsdale and the North Sea, and gateway to the North and West coasts of the Scottish Highlands, and Taigh Chearsabhagh on the Isle of North Uist in the Outer Hebrides, overlooking Lochmaddy (Loch nam Madadh – the Loch of the Hounds) tidal bay and situated on the shoreline of a marine Special Area of Conservation. 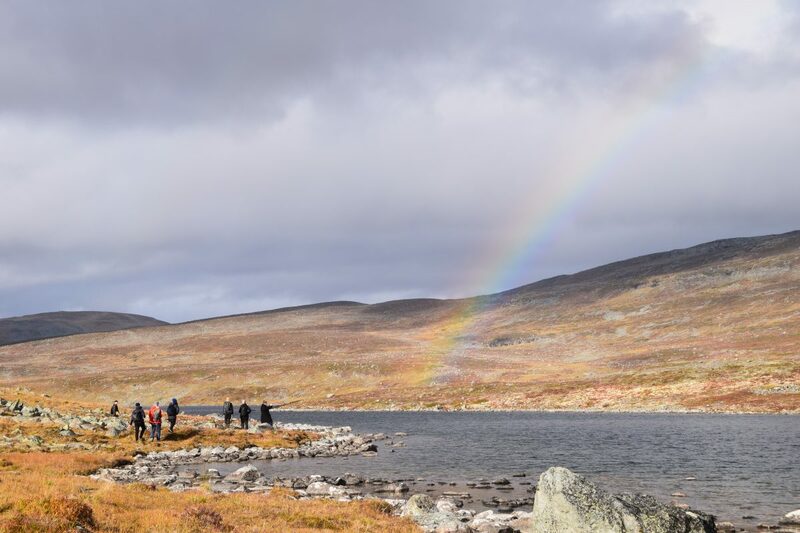 We are seeking applications from artists to undertake an extended three month residency spanning three different locations/ ecologies and organisations in Finland or Scotland. The North AiR Finnish partners are Mustarinda, KulttuuriKauppila Art Centre and Bioart Society. Together they will support one Scotland-based artist across their three sites in Finland. The North AiR Scottish partners are Scottish Sculpture Workshop (SSW), Taigh Chearsabhagh and Timespan. Together they will support one Finland-based artist across their three sites in Scotland. Opportunities to share experiences and research at the Finnish Institute, London, in July and in each selected artists’ home countries in September with support of partner organisations. Have a proven track record of making trans disciplinary work / research spanning (but not limited to) visual arts, live art and performance, dance, science, geography, anthropology and social practices. (A guideline for this is 5 years out of education, but we understand that experiences are developed over varying time periods so this is not a rigid marker). Are able to commit to the timeline and dates outlined in the schedule below. Please note applications for this residency programme are now closed. All Finland-based artists applying to undertake the 3 month residency in Scotland please apply online here. If you have any questions or problems with the application process please contact SSW Programme and Communications Manager: jenny[at]ssw.org.uk. When applying you are advised to complete your application off-line until it is ready to be submitted, as the contents of the forms cannot be saved before submission. All applications should be made in English. All applicants will be informed of the outcome of their application by 21 December 2018. Finland-based artists applying to Scotland: As an alternative to a written application, you can submit by video or audio. To do this please use the online application form. You can upload your cover letter and artist statement in the format of video (no more than 5 minutes long). In the fields Cover Letter and Artist Statement please write “[see video]”. Scotland-based artists applying to Finland: To submit a video or audio application please upload the file to Vimeo or YouTube, set as private and share the link and password in your application form. Due to the nature of this residency spanning six organisations access varies across each site and location. Please read about the partners via their websites in order to understand this in full. Please note that many of the partners are based in highly rural and often isolated locations with highly limited access to amenities and medical support. If you have any access requirements you would like to discuss or that we can assist with please contact jenny@ssw.org.uk or piritta.puhto@bioartsociety.fi in advance of making an application. North AiR is a network made up of Bioart Society, KulttuuriKauppila Art Centre, Mustarinda, Scottish Sculpture Workshop, Taigh Chearsabhagh (with support from the University of the Highlands and Islands) and Timespan. This programme is supported by The Finnish Institute in London and their Mobius Fellowship Programme.